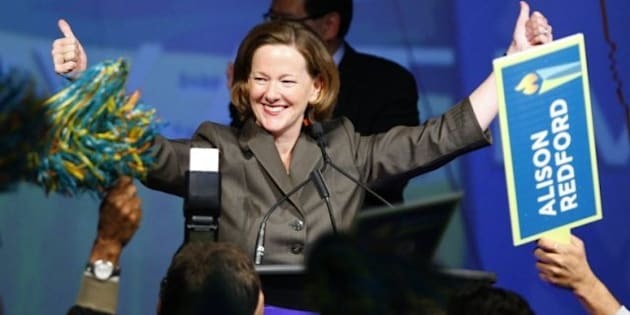 EDMONTON - In a week of heartbreak and triumph, Alison Redford saw her mom die in hospital and four days later delivered a stunning electoral upset that will see her become Alberta's first female premier. In doing so, the 46-year-old rookie legislature member rewrote the rules on electioneering, reaching over the heads of traditional power brokers to create a tidal wave of popular support through social media. Redford's voice quivered as she remembered her mother from the podium after she took the Alberta Progressive Conservative leadership. The party vote was held Saturday, but Redford had to wait until after 1 a.m. Sunday before her victory was confirmed. "I'm proud of my mom," she said. "She got me involved in politics 30 years ago. She's a big part of the reason I'm here and I'm thinking about her." Redford takes over as leader of the governing party and will become premier when she is sworn in. Premier Ed Stelmach remains in charge for now, but has already delivered his resignation letter. "Today, Alberta voted for change," Redford told supporters. "Make no mistake, we are going to do things differently. Over the last eight month we have opened the door for all Albertans to participate in our party and they did that today." Redford's team rallied supporters throughout the province to deny Gary Mar, the overwhelming favourite, the majority vote he needed to win outright on the preferential ballot. Mar collected 32,233 votes for 42.5 per cent of the vote. Redford had 28,993 for 37.1 per cent. Former deputy premier Doug Horner was third at 15,950 — 20.4 per cent. Under the preferential system, voters were allowed to mark their first and second choice. As Horner finished last, he dropped off the ballot and his votes were redistributed accordingly to Mar and Redford, giving her the win. Mars's supporters, seeing the writing on the wall, cried and hugged each other well over an hour before the results were announced. It was a stunning collapse for the 49-year-old former health minister under premier Ralph Klein. He was dubbed the front-runner the minute he entered the race in mid-March, quitting his post as Alberta's envoy to Washington. He had the biggest war chest and toured the province during the eight-month campaign in a big tour bus. He had the support of the majority of the Tory caucus. He captured 41 per cent of the vote in the first round of balloting two weeks ago, more than doubling Horner and Redford combined. However, he didn't gain a majority on Sept. 17, and under the rules, the bottom three candidates — Rick Orman, Ted Morton, and Doug Grifiths — dropped off the ballot, setting up Saturday's final round of balloting. The lead was considered so invicincible some of Mar's supporters pressured Horner and Redford to drop out for the sake of party unity. Caucus support has been seen as critical, given a politicians' contacts and their ability to reach out to party members to come out and vote. Stelmach rode the vote-getting prowess of northern caucus members to win the top job in 2006. Redford, however, had the support of just one caucus member at the start — Calgary backbencher Art Johnston — and the support of just four more after the Sept. 17 vote. But her campaign manager, Stephen Carter, had other ideas. Carter was on the team that delivered the stunning upset of Naheed Nenshi in Calgary's municipal elections. Using the power of social media to spread the word, Nenshi came from well back to win the mayor's chair in 2010. Carter used a similar strategy with Redford. The campaign eschewed traditional partisan left-right political labels and focused on Redford's ideas and personality. Carter called it a more humanistic approach, selling the Alison Redford story to community leaders and citizens. Carter called them "hyper-engaged" voters, those who shaped opinions and could spread their ideas through sites such as Facebook and Twitter. Whereas before they could tell two people, now they could tell 200. Redford's response to her mother Helen's death was also a galvanizing factor. The 71-year-old died suddenly in a Calgary hospital of an infection on Tuesday. Redford rushed to be at her side, but, at her mother's deathbed wish, was back on the campaign trail a day later to delivered the debate performance of her life. With 250,000 viewers looking on, Redford look poised and composed, hammering home points, challenging Mar on his musings to broaden privatized health care, and questioning his integrity. Her campaign was also a risky throw of the dice. In many respects, she ran against the record of Stelmach. She has promised to call a full, independent inquiry into allegations that doctors in the provincial health system have been coerced or intimidated into keeping quiet about avoidable patient deaths and other systemic ills. Stelmach's government rebuffed repeated opposition calls for such an inquiry during the legislature's spring session, saying the evidence didn't exist to merit such a probe. Redford has also promised to restore $107 million cut from the education budget, a decision that forced school boards to cut teachers and hike class sizes. It was the third time in 20 years that the first round winner in an Alberta Tory leadership campaign failed to win a majority on the first ballot and then get beaten in the second round. In 1992, Klein was edged by Nancy Betkowski in the first round but stormed back to win in the second ballot. In 2006, Jim Dinning led after the first ballot, but was beaten by Stelmach a week later. Redford now faces the challenge of uniting a party that is itself facing a challenge from the right-wing Wildrose party. Redford must also re-engage the party faithful. That's just 57 per cent of the 241,690 who voted in the two rounds of the 2006 leadership campaign.